Communication is supposed to cause something. That’s the point of it. So, what do you want to achieve following your communication? Do you want someone to answer ‘yes’? Do you want to improve your relationships? Do you want people to understand exactly what you’re talking about, first time? Whatever you want to achieve, you’ll need decent communication to get there, and expert and bestselling author Andy Bounds shows us exactly how to nail our communication. 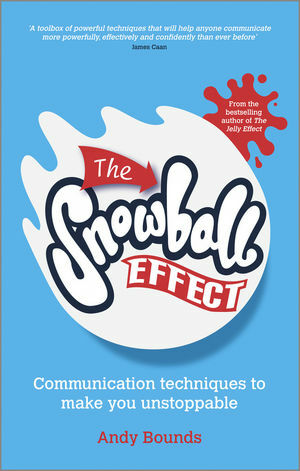 Using the same conversational style that made The Jelly Effect so popular, The Snowball Effect is packed with short, rapid fire sections complete with visuals and special features to help us get serious results from our communication. • Get more done, more quickly – because you’re getting people on your side faster (these techniques have saved people at least one month every year). Andy Bounds is a Communication Consultant, working with blue chip organisations all over the world. Awarded the title Britain's Sales Trainer of the Year, and described by AstraZeneca's Global Communication Director as "a genius, whose advice can’t be ignored", Andy’s insights stem from the fact his Mother is blind. This has given him a lifetime's experience of communicating from someone else’s point of view… so critical when seeking to persuade others. Andy typically speaks at 30-40 major conferences per year in over 20 countries, addressing tens of thousands of people. He has delivered keynotes at the Professional Speakers Association conference, as well as for blue-chip companies, Governments, professional bodies and business experts, to name but a few. When you want to . . .